If you are asking yourself "how do you pronounce edamame" then you are not alone! This interesting and nutritious soybean is gaining in popularity. Pronouncing the name and knowing how to cook edamame is not without challenges. Edamame is a form of soybean. Unlike the dried variety that many people are familiar with, edamame is green and fresh. Edamame is picked in its pod and it is often sold either in the pod or shelled. The name edamame is a Japanese word, meaning 'on the branch'. This describes how the bean is picked and prepared. The word edamame is actually very easy to pronounce. The syllables are broken down as follows - ay-duh-MAH-may with the emphasis on the third syllable. As the bean grows in popularity, so will people's familiarity with the name. Edamame is very simple to prepare. If the beans are bought still in their pod, then the edamame beans are shelled before cooking. Sometimes they are prepared in the pods and are served this way. People then 'pop' the edamame beans out of their shells when eating. 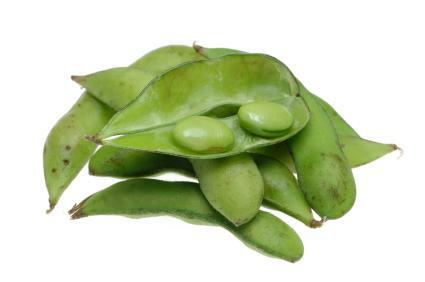 Edamame beans are often sold frozen, with an option of shelled or unshelled varieties. Edamame is cooked in the same way as other peas or beans. As the beans are fresh, they do not have the long preparation time that is typical with dried beans. Dried beans require soaking and boiling to make them edible. Edamame and other fresh beans can be eaten cooked or uncooked, depending on the recipe. Edamame is often cooked in a stock that has been prepared with a blend of herbs and spices. This imparts a subtle flavor to the beans. Edamame can be eaten as a starter, in a salad or as an accompaniment to a main course. The edamame bean can be used as an alternative to other beans in vegan and vegetarian recipes and works well with tofu. Edamame is becoming increasingly easy to find. At one time it was only available in Asian supermarkets or specialist stores. Today, however, it is sold in mainstream supermarkets and health food stores. While fresh edamame is still comparatively difficult to find, frozen and tinned edamame is becoming widely available. While the edamame bean is a staple of the Asian diet, it is relatively new in the US. The popularity of the bean has grown since the nutritional benefits have been highlighted by some popular diets. Edamame is high in protein and, for a bean, low in carbohydrate. This makes it perfect for people who are following a low carbohydrate diet. Being high in protein edamame is also ideal for vegetarians and vegans who do not receive protein in their diet from meat or fish products. Evergreen Seeds - a range of seeds for people wanting to grown their own edamame. Although many people still wonder "how do you pronounce edamame" given time it will become common place in our language in the same way that many other words have over the years.